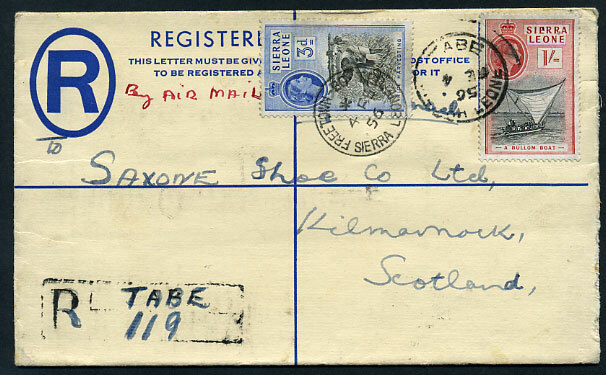 1943 Lightbourn & Co cover to Bishop Auckland, England with KG6 7½d (defective) pmk'd Hamilton 25 FEB 43 with red handstruck boxed "Returned for (1/1½d) Postage" deleted when KG6 1½d, 1/- affixed the next day for postage due and pmk'd Hamilton 26 FEB 43, censor label C/8148 at left. 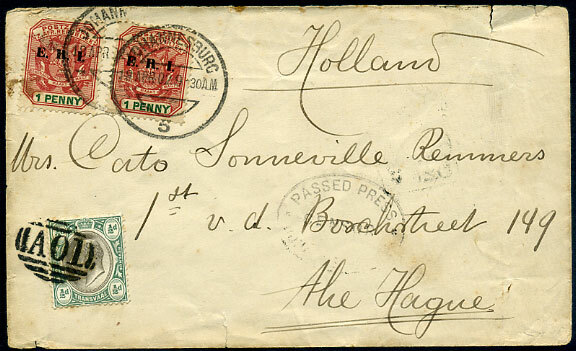 1902 censored cover to The Hague, Holland with 2 x 1d E.R.I. 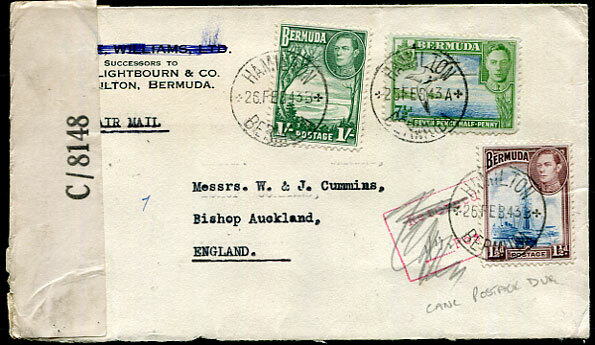 overprints tied Johannesburg 18 APR 02 with further uncancelled KE7 ½d firmly "killed" by obsolete Jamaica "A01" numeral Type E transferred to London Foreign Branch to cancel loose mail. 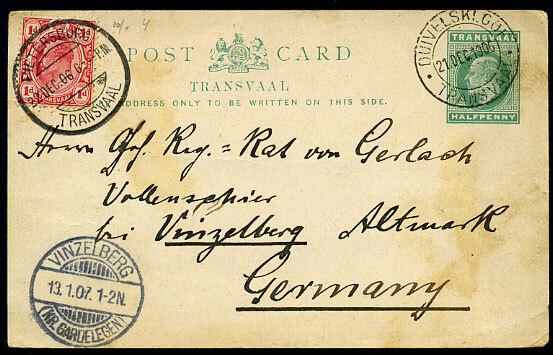 on KE7 ½d Post Card pmk'd Duivelskloof 21 DEC 1906 with added KE7 1d tied Pitersburg 22 DEC 06 written at Medingen to Germany, some soiling. 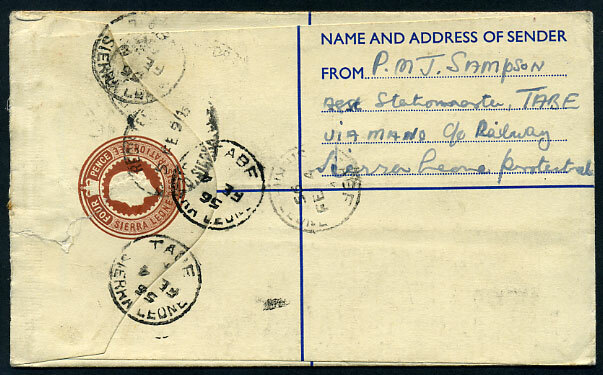 most unusual combination of TABE (149.01) dated FE 4 56 (slugs inverted) tying QE2 1/- and FREETOWN-BO T.P.O. (202.03) tying QE2 3d added QE2 4d PSRE to Saxone Shoe, England. Boxed TABE reg. 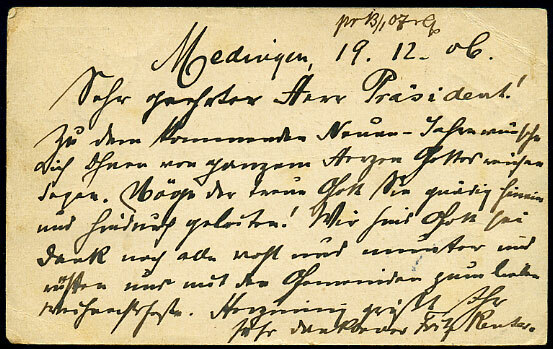 h/stamp (m/script assisted) and senders address of Asst. Stationmaster, Tabe.